WASHINGTON — Before arranging a meeting with a Kremlin-connected Russian lawyer he believed would offer him compromising information about Hillary Clinton, Donald Trump Jr. was informed in an email that the material was part of a Russian government effort to aid his father's candidacy, according to three people with knowledge of the email. The email to the younger Trump was sent by Rob Goldstone, a publicist and former British tabloid reporter who helped broker the June 2016 meeting. In a statement Sunday, Trump acknowledged that he was interested in receiving damaging information about Clinton, but he gave no indication that he thought the lawyer might have been a Kremlin proxy. Goldstone's message, as described to The New York Times by the three people, indicates that the Russian government was the source of the potentially damaging information. It does not elaborate on the wider effort by Moscow to help the Trump campaign. There is no evidence to suggest that the promised damaging information was related to Russian government computer hacking that led to the release of thousands of Democratic National Committee emails. The meeting took place less than a week before it was widely reported that Russian hackers had infiltrated the committee's servers. But the email is likely to be of keen interest to the Justice Department and congressional investigators, who are examining whether any of President Donald Trump's associates colluded with the Russian government to disrupt last year's election. U.S. intelligence agencies have determined that the Russian government tried to sway the election in favor of Trump. The Times first reported on the existence of the meeting on Saturday, and a fuller picture has emerged in subsequent days. Alan Futerfas, the lawyer for the younger Trump, said his client had done nothing wrong but pledged to work with investigators if contacted. "In my view, this is much ado about nothing. During this busy period, Robert Goldstone contacted Don Jr. in an email and suggested that people had information concerning alleged wrongdoing by Democratic Party front-runner, Hillary Clinton, in her dealings with Russia," he told The Times in an email Monday. "Don Jr.'s takeaway from this communication was that someone had information potentially helpful to the campaign and it was coming from someone he knew. Don Jr. had no knowledge as to what specific information, if any, would be discussed." It is unclear whether Goldstone had direct knowledge of the origin of the damaging material. One person who was briefed on the emails said it appeared that he was passing along information that had passed through several others. Jared Kushner, the president's son-in-law, and Paul J. Manafort, the campaign chairman at the time, also attended the June 2016 meeting in New York. Representatives for Kushner referred requests for comments back to an earlier statement, which said he had voluntarily disclosed the meeting to the federal government. He has deferred questions on the content of the meeting to Trump Jr.
A spokesman for Manafort declined to comment. But at the White House, deputy press secretary Sarah Huckabee Sanders was adamant from the briefing room lectern that "the president's campaign did not collude in any way. Don Jr. did not collude with anybody to influence the election. No one within the Trump campaign colluded in order to influence the election." The president, a prolific Twitter user, did not address his son's controversy Monday, and instead sought to highlight other issues throughout the morning. In a series of tweets, the president's son insisted he had done what anyone connected to a political campaign would have done — to hear out potentially damaging information about an opponent. He maintained that his various statements about the meeting weren't in conflict. "Obviously I'm the first person on a campaign to ever take a meeting to hear info about an opponent … went nowhere but had to listen," he wrote in one tweet. In another, he added, "No inconsistency in statements, meeting ended up being primarily about adoptions. In response to further Q's I simply provided more details." The younger Trump, who had a reputation during the campaign for having meetings with a wide range of people eager to speak to him, did not join his father's administration. He runs the family business, the Trump Organization, with his brother Eric. On Monday, after news reports that he had hired a lawyer, he indicated in a tweet that he would be open to speaking to the Senate Intelligence Committee, one of the congressional panels investigating Russian meddling in the election. "Happy to work with the committee to pass on what I know," the younger Trump wrote. Goldstone represents Russian pop star Emin Agalarov, whose father was President Donald Trump's business partner in bringing the Miss Universe pageant to Moscow in 2013. In an interview Monday, Goldstone said he was asked by Agalarov to set up the meeting with Trump Jr. and the Russian lawyer, Natalia Veselnitskaya. "He said, 'I'm told she has information about illegal campaign contributions to the DNC,'" Goldstone recalled, referring to the Democratic National Committee. He said he then emailed Trump Jr., outlining what the lawyer purported to have. But Goldstone, who wrote the email more than a year ago, denied any knowledge of involvement by the Russian government in the matter, saying that never dawned on him. "Never, never ever," he said. Later, after the email was described to The Times, efforts to reach him for further comment were unsuccessful. In the interview, he said that it was his understanding that Veselnitskaya was simply a "private citizen" for whom Agalarov wanted to do a favor. He also said he did not know whether Agalarov's father, Aras Agalarov, a Moscow real estate tycoon known to be close to Russian President Vladimir Putin, was involved. The elder Agalarov and the younger Trump worked together to bring a Trump Tower to Moscow, but the project never got off the ground. Goldstone also said his recollection of the meeting largely tracked with the account given by the president's son, as outlined in the Sunday statement Trump Jr. issued in response to a Times article on the June 2016 meeting. Goldstone said that the last time he had communicated with the younger Trump was to send him a congratulatory text after the November election, but he added that he did speak to the Trump Organization over the past weekend, before giving his account to the news media. 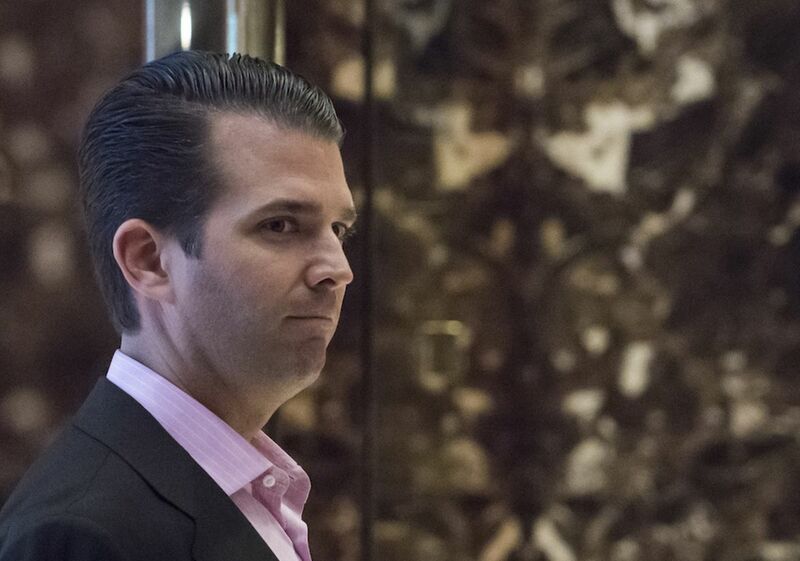 Trump Jr., who initially told The Times that Veselnitskaya wanted to talk about the resumption of adoption of Russian children by American families, acknowledged in the Sunday statement that one subject of the meeting was possibly compromising information about Clinton. His decision to move ahead with such a meeting was unusual for a political campaign, but it was consistent with the haphazard approach the Trump operation, and the White House, have taken in vetting people they deal with ahead of time. But he said the Russian lawyer produced nothing of consequence, and that the meeting ended after she began talking about the Magnitsky Act — an American law that blacklists Russians suspected of human rights abuses. The 2012 law so enraged Putin that he halted American adoptions of Russian children. Goldstone said Veselnitskaya offered "just a vague, generic statement about the campaign's funding and how people, including Russian people, living all over the world donate when they shouldn't donate" before turning to her anti-Magnitsky Act arguments. "It was the most inane nonsense I've ever heard," he said. "And I was actually feeling agitated by it. Had I, you know, actually taken up what is a huge amount of their busy time with this nonsense?" Veselnitskaya, for her part, denied that the campaign or compromising material about Clinton had ever come up at all. She said she never acted on behalf of the Russian government. A spokesperson for Putin said Monday that he did not know Veselnitskaya, and had no knowledge of the June 2016 meeting. "I never had any damaging or sensitive information about Hillary Clinton," Natalia Veselnitskaya told NBC News in an interview Tuesday in Moscow. "It was never my intention to have that." Veselnitskaya said she did not know why Trump Jr. believed she was planning to offer damaging information about Clinton, saying she only knew he was willing to meet with her. "It is quite possible that maybe they were longing for such information," she told NBC. "They wanted it so badly that they could only hear the thought that they wanted." Sanders said at a news briefing that the American president had learned of the meeting recently but declined to discuss details. The White House press office, however, accused Clinton's team of hypocrisy. The office circulated a January story published in Politico, detailing how officials from the Ukranian government tried to help the Democratic candidate conduct opposition research on Trump and some of his aides. News of the meeting involving the younger Trump, Kushner and Manafort blunted whatever good feeling the president's team had after his trip to Europe for the Group of 20 economic summit meeting. The president learned from his aides about the 2016 meeting at the end of the trip, according to a White House official. But some people in the White House had known for several days that it had occurred, because Kushner had revised his foreign contact disclosure document to include it. The president was frustrated by the news of the meeting, according to one person close to him — less over the fact that it had happened, and more because it was yet another story about Russia that had swamped the news media cycle. Material from Reuters is included in this report.